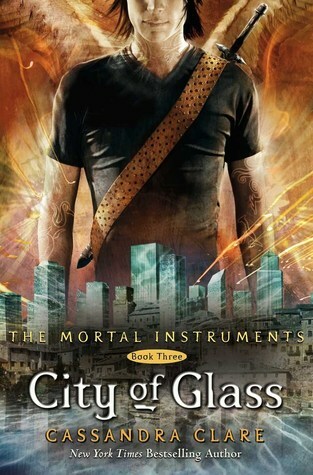 The third installment in Mortal Instruments series is my favourite so far. Another action-packed series, although it is a lot darker than the previous books. In this story Clary manages to make her way to Idris, the homeland of the shadowhunters, despite Jace protecting (tricking) her into staying home. My main question is how could Valentine mingle demon blood with his own baby's? What an evil, twisted man. When I read this, I thought this child cannot be Jace (or rather, I was hoping it would not be Jace). Usually I am very poor at spotting mistakes but in this case I guessed fairly quickly that Sebastian was the demon son. However that may not have been quite an achievement considering I could not figure out who Jace's father was. Poor Jace, he must be utterly confused by now. He's been told the wrong identity twice, stumbles across his 'dead' father only to be told he was not his real father but had been tricked all his life, falls in love with Clary and then realises Clary is his sister and then that she is not! Phew, I am getting dizzy just trying to keep up, and that's only half of it. I can guess Jace will be very paranoid from now, trying to separate the truth from the half-truths and the outright lies. As always, the book leaves you wanting more. Thankfully, there are two more published in this series and then I believe there is a separate series written by Cassandra Clare so that should take me to next week! "Give him time. You did break up with him." "Because you weren't in love with him. That's an iffy proposition.."
"Even if you thought it would help the Clave," Simon said, "you'd never let them have her." "What makes you say that vampire?" "...No human being can create new runes, or draw the sort of runes Clary can. Only angels have that power. And sine Clary can do that-well, it seems like a portent. Things are changing. The laws are changing The old ways may never be the right ways again. Just as the rebellion of the angels ended the world as it was- it split heaven in half and created hell- this could mean the end of the Nephilim as they currently exist. This is our war in heaven, vampire, and only one side can win it. And my father means it to be his." Samuel's voice rose to a scream. "GO AWAY!" Simon looked sideways at Jace. "I think he means it." Jace shook his blond head in exasperation. "You had to make a crazy jail friend, didn't you? You couldn't just count ceiling tiles or tame a pet mouse like normal prisoners do?" "She won't come out of her room," he said. "She thinks what happened to Max was her fault. She wouldn't even come to the funeral." "Have you tried talking to her?" "No," Jace said, "we've been punching her repeatedly in the face instead. Why, do you think that won't work?" "...In fact, it wouldn't hurt if you just spent the next few days inside. You can lock yourself in your room like Isabelle." "Of course you're not," said Jace, "because you love to torture me don't you?" "Not everything, Jace, is about you," Clary said furiously. "Probably," Jace said, "but you have to admit that the majority of things are." "I have given everything for this cause. My wife. My children. I have not withheld my sons. I have given everything I have for this- everything." The Angel simply hovered, gazing down at Valentine with his weird, inhuman eyes. His wings moved in slow, undeliberate motions, like the passage of clouds across the sky. At last he said, God asked Abraham to sacrifice his son on an altar much like this one, to see who it was that Abraham loved more, Isaac or God. But no one asked you to sacrifice your son, Valentine. "I mean that I would never date a girl who insisted that I cut you out of my life, it's non-negotiable. You want a piece of all this fabulousness?" He gestured at himself. "Well, my best friend comes along with it. I wouldn't cut you out of my life, Clary, any more than I would cut off my right hand and give it to someone as a Valentine's Day gift." "Gross," said Clary. "Must you?" "Brown is a manly colour," said Jace, and yanked on a stray lock of Isabelle's hair with his free hand. "In fact, look-Alec is wearing it." Alec looked mournfully down at his sweater. "It was black," he said. "But then it faded." "Patience, grasshopper," said Maia. "Good things come to those who wait." "I always thought that was 'Good things come to those who do the wave,'" said Simon. "No wonder I've been so confused all my life."